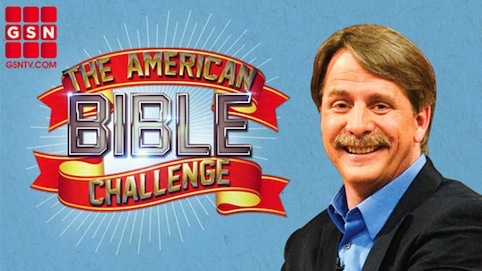 The Thursday, Aug. 23rd premiere of GSN's The American Bible Challenge is now the network's most-watched program ever. How do I know? The Bible tells me so. Actually, GSN (former Game Show Network) is trumpeting the show's Nielsen numbers in a publicity release. Bible Challenge drew 1.7 million viewers nationally, the biggest haul in GSN's 17-year history. "The best-selling book of all time is now GSN's most-viewed program of all time, which proves that consumers are yearning for fun, family-friendly entertainment," says VP of programming and development Amy Introcaso-Davis. The Plano-based Team Minnie's Food Pantry bested two other teams Thursday to advance to Bible Challenge's semi-finals. Eighteen teams are competing for a grand prize of $100,000 for their designated charity. Team Minnie took home $20,000 for starters. The one-hour show is hosted by Jeff Foxworthy. The times are ever-changing in TV Land. Fledgling FX didn't have any original series at all when Keri Russell's Felicity, curls and all, premiered in 1998 on the then hot WB network. Now WB is defunct, FX has a boatload of homegrown weekly series and Russell is coming back to prime-time in the network's The Americans. FX announced Thursday that it's ordered 13 episodes of the Cold War period drama, which originates at the outset of Ronald Reagan's presidency. Russell and Matthew Rhys (Brothers and Sisters) play married KGB spies Elizabeth and Phillip Jennings, who pose as Americans while living in suburban Washington, D.C. Their two children remain in the dark. FX president and GM John Landgraf says in a publicity release that The Americans crackles with incredible performances rooted in character perspectives never explored on a U.S. television series." It's scheduled to premier in early 2013. ***Having banished Keith Olbermann for alleged malfeasance on the job, former Vice President Al Gore has taken it upon himself to anchor Current TV's Republican and Democratic national convention coverage. 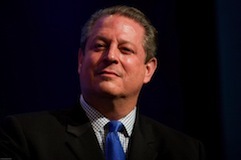 Gore, also the founder of the network, will be joined by Current personalities Jennifer Granholm, Eliot Spitzer and Cenk Uygur, with Joy Behar and John Fugelsang also contributing. The GOP convention starts Aug. 27th and the Democrats convene on Sept. 4th. The Dems are allotting just three days this time while the Republicans will take the traditional four-day route.